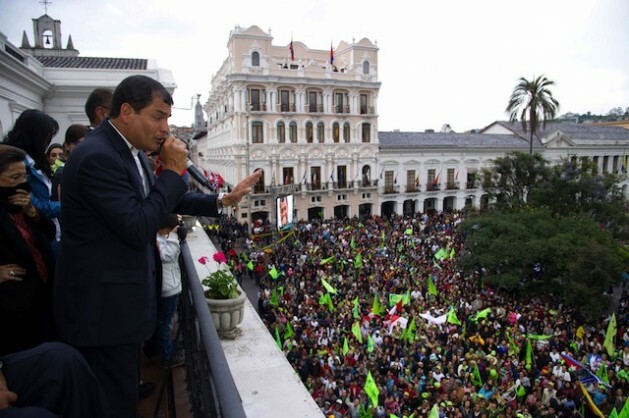 QUITO, Feb 18 2013 (IPS) - Ecuador’s President Rafael Correa secured yesterday his third term in office by a landslide, after vowing to radically deepen his project of citizens’ revolution by making the changes achieved thus far “irreversible”, fully achieving the goals of eradicating poverty, transforming the model of production and consolidating the “rule of the people”. Initial data from the National Electoral Council give the centre-left candidate 56.7 percent of the votes in the national elections held this Sunday, Feb. 17, putting him well ahead of his greatest challenger, right-wing candidate Guillermo Lasso, with 23.3 percent. This ample margin means Correa can begin his third consecutive term since 2007 without the need for the runoff required under the constitution unless the leading candidate obtains either 50 percent of the valid vote or 40 percent with a 10-point advantage over the nearest contender. While Correa maintains that his government will continue to focus on social transformation, he noted that a change in the model of production and job creation would be the priorities this term. This strategy is reflected in his choice of running mate, as the profile of vice president-elect Jorge Glas is more technical than political, and in Correa’s agenda, which involves promoting change through projects in the fields of oil production, energy resources, water, electricity and information and telecommunication technologies. This transformation, which had already begun with restrictions on imports of consumer goods and higher tariffs for luxury items, will demand more value added on national products and strengthening popular and solidarity economy schemes, but without excluding private capital involvement. Oil, Ecuador’s largest source of foreign revenue, with a record 98 dollars per 159-litre barrel in 2012, will continue to underpin the government’s investment in social programmes, which last year absorbed 15.3 percent of the country’s gross domestic product (GDP) and are projected to require 16.6 percent in 2013. According to the National Planning and Development Secretariat, public investment grew six-fold in the last six years, standing at 6.29 billion dollars in 2012. Speaking to the press following his second re-election, the leader of the governing Alianza País (AP) party said that the chief goal for the next four years would be to make “irreversible the shift in power relations in favour of the people and the great majorities” through the implementation of “solid economic policies, prioritising the ‘social debt’ (over debt to foreign creditors), but without neglecting efficiency”. Correa stressed that “the challenge is to move more quickly but in the same direction”, adding that the people have confirmed at the polls their desire to “bury once and for all the ‘partocracy’ that has inflicted so much damage” on the country, in reference to the monopoly of power held by political parties. Correa is confident that the massive support he received from voters will give him a large majority in parliament, which will thus be able to pass key bills on issues such as communications, water, land and criminal code reform, which had been stalled until now. On Feb. 17, Ecuadorians also elected 137 members of the National Legislative Assembly and five Andean Parliament representatives. Legislator Virgilio Hernández, re-elected under the AP ticket, told IPS that one of the great tasks ahead is to “build a post-oil Ecuador, going beyond a commodity-based economy”, while “making major changes to achieve energy sovereignty, continue developing the country’s road system and implementing large infrastructure works”. He also spoke of the need to advance towards “a true and radical agrarian revolution” and implement credit and technology policies that will guarantee food sovereignty and security. Hernández noted that significant progress has already been made, but social welfare, health and education are permanent issues on the government’s agenda. Work is needed to “ensure the full enjoyment of rights and social welfare” by all Ecuadorians, and achieve greater wealth distribution, with “more equality and social justice”. Nonetheless, economic performance will be decisive in determining whether the Correa administration will retain its level of popularity, Hernán Ramos, a political and economic analyst, told IPS. Ramos believes that one of the key factors of the president’s stability is the steady growth of GDP, fuelled by favourable oil prices, increasing government revenue and a high level of domestic consumption. The government’s “project would suffer if the economy’s stability were to waver” for any reason, even an international crisis, Ramos cautioned. In terms of politics, the analyst observed that Correa’s three victories at the polls had succeeded in dealing a mortal blow to a political leadership that was “historically responsible for the crises that dragged the country down”, as with this new win “the opposition has been broken”. Unlike in 2007, when he took office for the first time, Correa now has several advantages. Firstly, the political experience gained after six years at the country’s helm; secondly, the strength gathered by his movement; and thirdly, ironclad media protection (in the form of a media regulatory body created in a 2011 referendum to stop media excesses), Ramos explained. The president had promised that this would be the last time he ran, as he considered it in the country’s “best interest”. However, his movement lacks a figure strong enough to replace him after this term, a political weakness that could be overcome by AP if “it succeeds in grooming new leaders that can at least consolidate its political leadership in the country”, Ramos said. Counting elections and referendums, Correa achieved his ninth victory at the polls on Sunday and holds an indisputable leadership after six years in which, in his own words, he “re-founded the nation” with a new constitution in 2008 that launched an era of good living and turned the state into the leading economic and political agent. When his third term is up in 2017, Correa will have completed a decade in power.